The 2003 Platinum Eagle was produced by the United States Mint in both bullion and collector proof format. The coins were released during a year of steady gains for the market price of platinum, which seemed to have an impact on sales levels. The bullion versions of the coin were offered in the standard one ounce, one-half ounce, one-quarter ounce, and one-tenth ounce weights. Distribution took place through a network of authorized purchasers who could order the coins in bulk quantities directly from the US Mint for resale to other dealers and the public. The authorized purchasers were also responsible for establishing a two way market for the bullion coins. Sales fell across all four weights, with sales of the one ounce coin falling below the 10,000 level for the first time. 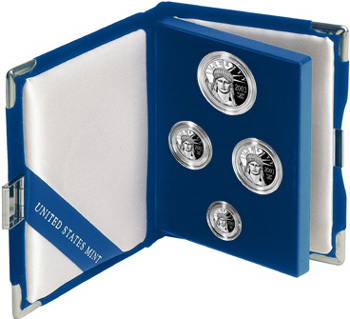 On September 17, 2003, the US Mint began accepting orders for the 2003 Proof Platinum Eagle. The coins were available in the same four weights, either individually or as part of a four coin set. The reverse design, which rotated annually for the collector coins, featured a bald eagle perched on a Rocky Mountain pine branch superimposed over an image of the flag. This was indicated as the first time that the bald eagle and American flag have appeared together on a United States coin. The rising market price of platinum, prompted the US Mint to increased prices for the offerings. The increases varied by product, but ranged from 31% to 44%. The maximum mintage levels were maintained at the same levels as the previous year. The higher pricing seemed to have a detrimental impact on sales, with orders lower across each option. At the beginning of the year, the market price of platinum was around the $600 level. A steady rise brought the price to a peak of around $850 by the end of the year. The average price across the entire year was $691.31.